My needles have been super busy! This weekend my husband had a bowling tournament, so I ended up getting a lot of knitting done. (Granted I used bulky or super bulky yarns) The total number of FOs was 4: 3 cowls and a hat. I had been very curious about working with super bulky yarn, so when I saw Hometown USA for $2.97 at Walmart, I figured it was worth a shot. I picked up 3 skeins in a lovely blue called Washington Denim to try things out. The yarn is 100% acrylic and very cushy soft. 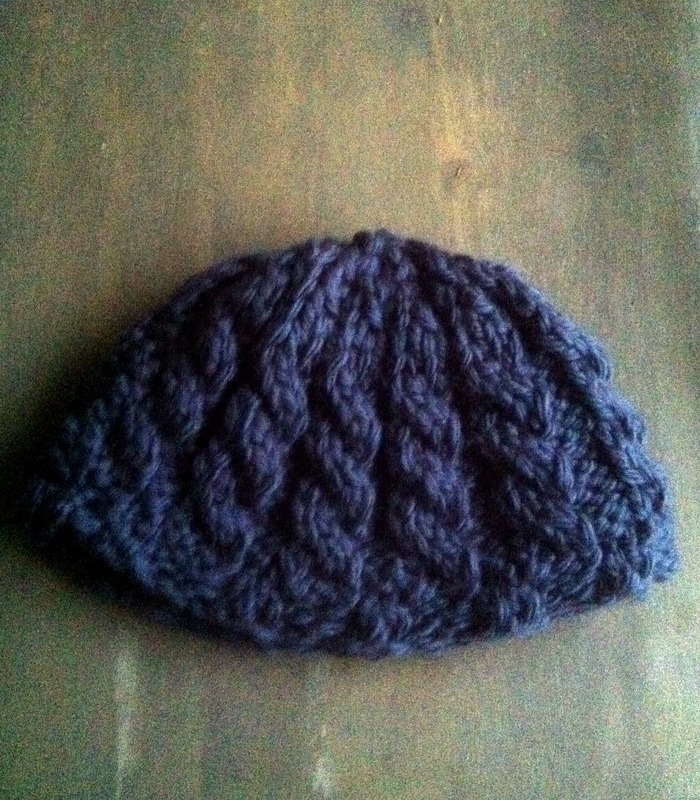 I picked out a pattern (Speedy Cabled Beret by Paulina Chin) for a hat in the super bulky and got started. Sometimes my reading skills leave me wanting. It took 3 or 4 tries before I realized I was reading a flat pattern while trying to knit in the round. The pattern was really easy to follow, which meant I got lost and ended up doing something completely different by accident. For instance, my hat only has the ribbing on the smaller needles, rather than continued onto the larger needles. Also, I forgot to always go back to the start of the cable repeat and have shorter cables as a result. Somewhere along the way, I messed up on the decreases, too. All that said, I still love the hat. It’s not a tight hat but kind of just sits on my head. That’s the kind of hat I prefer. It stays in place, even with gusts of wind, and keeps me warm. Plus the color! Once that was off the needles, I immediately searched for a cowl to wear with it. 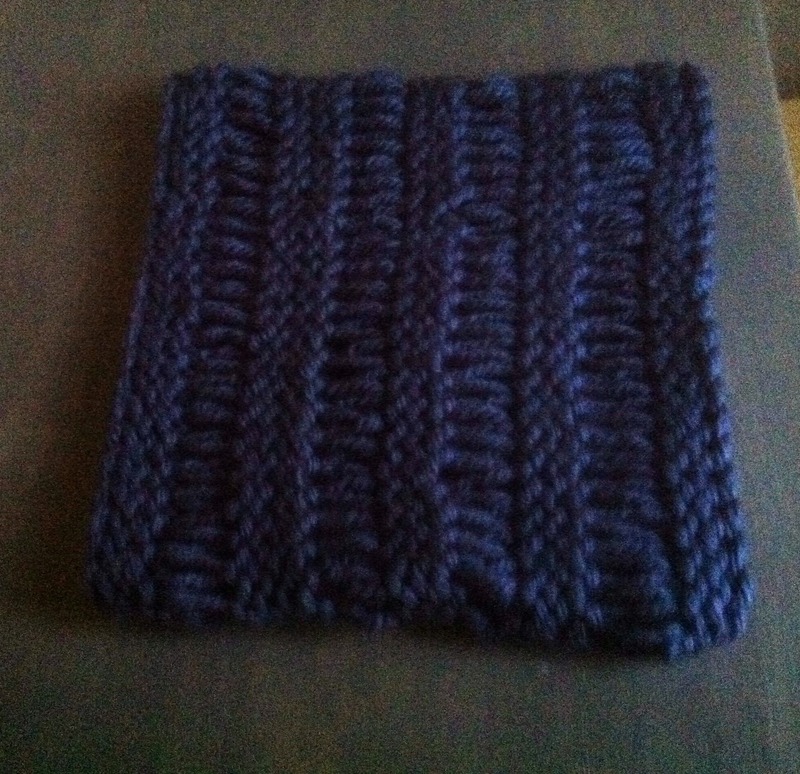 I didn’t want a cabled cowl or anything that would look too similar to the hat. I like coordinating, not matchy-matchy. I ended up choosing the Drop Stitch Cowl by Abi Connors. I’d seen the drop stitch technique a lot but figured it was way out of my league difficulty-wise. This pattern, however, made it really simple. I still messed up on one row, but only I can really see it. I absolutely love this drop stitch cowl. 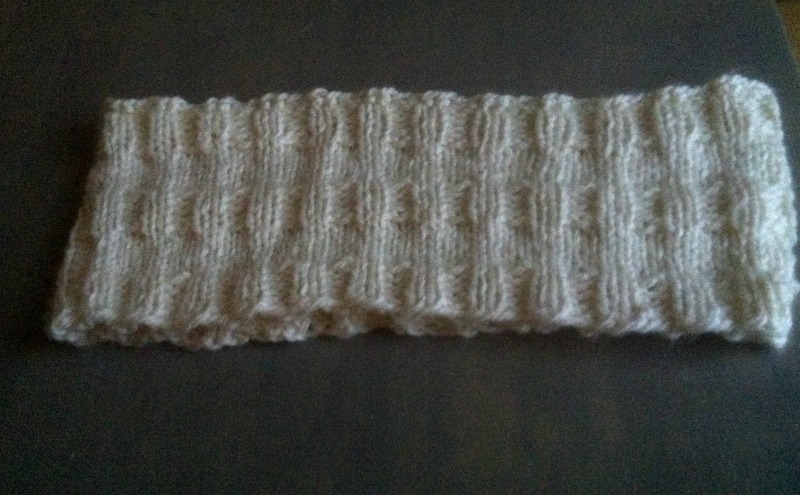 As if that wasn’t enough, I also knit up a version of Thick and Quick Ribbed Cowl by Naomi Adams. Mine is shorter than in the pattern, but I still quite like it. The sweater grew a couple of inches this weekend. This was the project that followed me to the bowling alley the one time this weekend that I tagged along with my husband. I keep forgetting that the length of my cable will not be the width of the sweater. The stitches are stretched out across the additional 7 inches of the cable, which makes the whole thing absolutely huge. I got a few quips from bowlers asking if I’d be done by the time the tournament was over, but luckily no one came up and said “Oh, my grandmother used to crochet!” like I’ve had happen in the past. Also, the sock project is back on! After much indecision about where the next sock project should go, I settled on the lovely Springgrass Socks by Stephanie Degen. I’m just about finished with the toe and about to start the foot pattern. This is my first patterned foot, so I’m a little nervous. I’m also not sure I picked the right yarn. I’m using a self-striping yarn from Lion Brand. I’m a little worried the stripes might over-power the design. We’ll see, I guess.